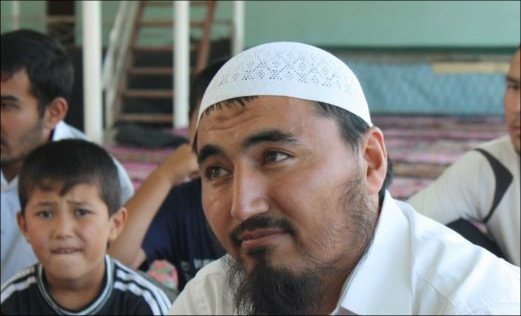 Late on Wednesday, February 11, a judge considered an issue of a measure of restraint in regards with Rashod Kamalov (also spelled Kamolov), 37, who is imam at the As-Sarakhsiy Mosque in Kara-Suu District of Osh Region, Kyrgyzstan. Imam Kamalov was arrested two days ago based on allegations that he urged to establish a caliphate and made extremist statements regarding the war in Syria. The judge ruled to arrest Mr. Kamalov for two months, the suspect’s lawyer Nazgul Suyunbayeva told Fergana. 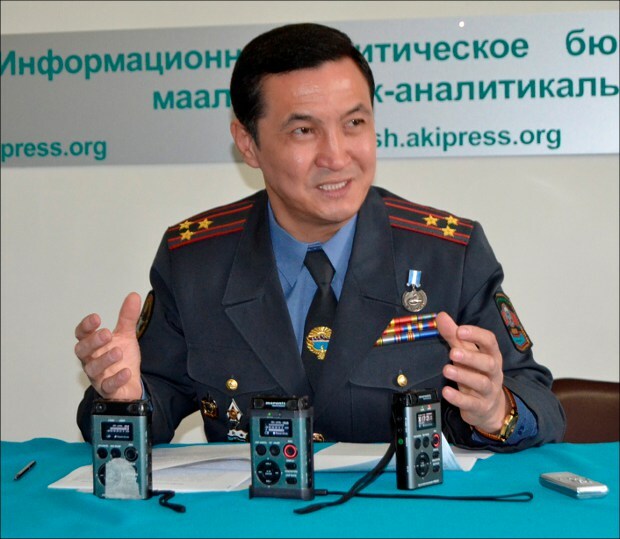 “Rashod Kamalov is charged with Article 299 (Inciting ethnic, racial, religious or regional animosity)” and Article 299-1 (Organizing activities aimed at inciting ethnic, racial, religious or regional animosity) of the Crime Code of Kyrgyzstan. 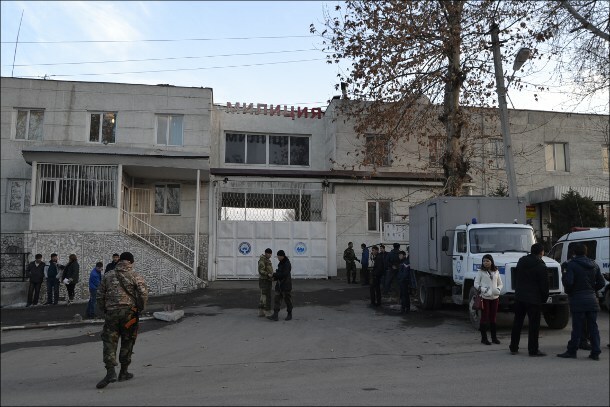 The court session took place in the building of the Osh City Internal Affairs Directorate. This is wrong! The judge came, issued a ruling and left. They did not pay attention even to the fact that we have the right to express no confidence in the judge. We will appeal the ruling in higher [judicial] instances,” the lawyer told journalists. 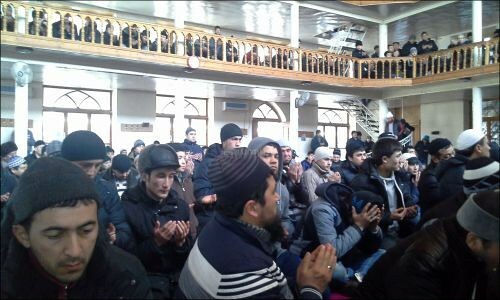 According to Raim Salimov, the deputy chief of Department 10 under the ministry of internal affairs, 10 residents of Kara-Suu District lodged complaints with police against the imam of the As-Sarakhsiy Mosque. They allege that the imam recruited their children to participate in armed hostilities in Syria. “There are many people who complain the imam of this mosque sent their children to Syria. But the majority of these people are afraid to lodge complaints; only 10 people have done so at this time. Accomplices that helped the imam in this matter have also been identified. There are testimonies on Kamalov [received] from Kara-Suu itself and other towns, where he was active, which read that people would literally turn into “zombies” after visiting him at the mosque,” Mr. Salimov told a press conference on February 11. On the day Mr. Kamalov was detained, Department 10 officers searched the house of 22 other people suspected of extremist and terrorist activities. “DVDs, flash cards and several magazines were seized at Rashod Kamalov’s house. All these items, seized leaflets and literature are under theological examination at this time. Upon obtaining the findings of the examination, the issue of holding a very big group of people criminally liable will be raised. [We are] also looking into what position Kamalov held at the mosque. Local residents earlier called him their imam, but later it was said he is not imam. An examination of [his work] identification revealed that it is written he is the imam,” Mr. Salimov told journalists. According to Raim Salimov, when Mr. Kamalov was being arrested, a fact of assembly of around 500 aggressive residents was registered. When the detainee’s house was being legitimately searched, they attempted to prevent law-enforcement and investigation bodies’ activities. However, provocations were preempted. 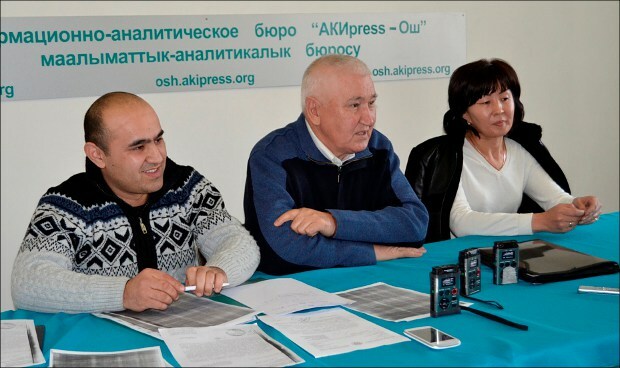 Immediately after Salimov’s press conference, Mr. Kamalov’s lawyers held their own press conference as well. They state that findings of the theological examination of the books seized during the search were obtained illegally. The investigation bodies have violated a very simple procedural step—they provided the seized items and books to an organization, which has no legitimacy or qualification to hold such examinations. “When Kamalov was detained, a disc allegedly carrying extremist ideas was seized. The finding of an examination [stating this] was obtained illegally and from a wrong organization. The State Committee for Religious Issues carried out this examination even though it is not authorized to provide such conclusions,” Mr. Kamalov’s lawyers maintain. According to the legislation, such a task must be fulfilled by the Center for Judicial Examinations. Inside the As-Sarakhsi Mosque. Photo by AKIpress. Various sources reported February 11 that some 200 people rallied in Kara-Suu in Rashod Kamalov’s support. However, this report was not confirmed by either people close to Mr. Kamalov nor law-enforcement agencies. 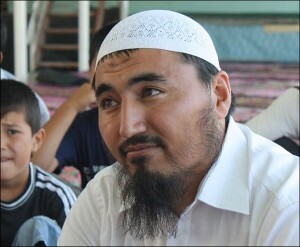 Reshod Kamalov is an ethnic Uzbek citizen of Kyrgyzstan. He is the son of the late renowned and influential religious activists Muhammadrafiq Kamalov, who was also known as Rafiq-Qari. 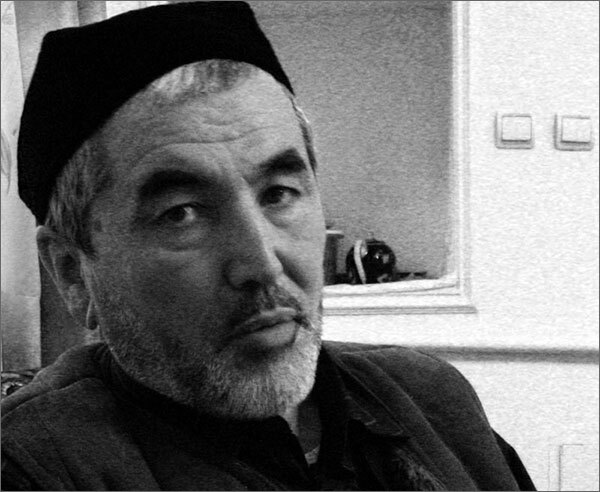 According to Professor Stephane Dudoignon, a respected French researcher into Islam, Rafiq Kamalov and his missing relative, an Uzbek citizen Abduvali-Qari Mirzayev, were leading figures of the so-called “reformist Islam” in the post-Soviet Central Asia. Kamalov Senior was suspected of assisting terrorists since early 2006: he was summoned for questioning several times, but he was released every time apparently due to lack of sufficient evidence to arrest him. In August 2006, Muhammadrafiq Kamalov was shot dead by a special operations squad when he was crossing a military checkpoint in Southern Kyrgyzstan. The Kyrgyz authorities later claimed that this assassination took place during a joint Uzbek-Kyrgyz anti-terrorism special operation. Kamalov Senior was eliminated in very times the country was going through in ex-President Kurmanbek Bakiyev’s ruling period. However, apparently the growing authority of Kamalov Junior among the big number of his parish is now disturbing the peace of the incumbent authorities. In early 2011, Rashod Kamalov was arrested on fraud and embezzlement charges. A court ruled he was innocent and released him in one month. Mr. Kamalov told Azattyk Radio: “The court ruled that the fraud charged pressed against me is devoid of any grounds and released me. I have never committed anything like this. The investigators were interested in my work as an imam at the mosque,” he said shortly after his release. It is very difficult to navigate the situation around the Kamalovs family. One needs both theologians’ and lawyers’ consultations. Of course, not only that but also professionalism and impartiality on the part of investigation bodies and courts. However, one thing is certain: Law-enforcement and judicial bodies continue completely forgetting about human rights and respect for appropriate procedures in their chase for success in “combating extremism.” The “vogue” topic of “combating the Islamic State,” which continues to gain momentum, is allowing any and all states in the world to easily eliminate opponents by accusing them such religious extremism that is obviously dangerous for any society. Numerous protests and complaints by society and rights advocates are falling on deaf ears. Apparently, something like that is happen in the south of the modern and “democratically reformed” Kyrgyzstan at this time.